Yes. I know. I might, possibly, need an intervention. Yet another tie headband. What can I say? I am obsessed with the fun, quick projects! 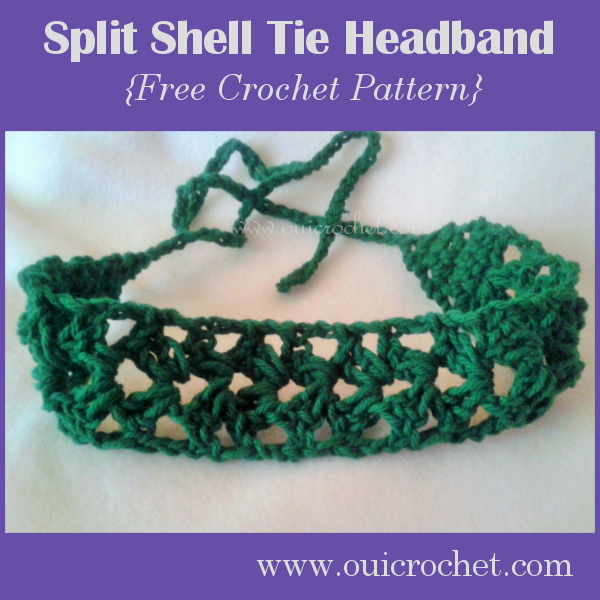 This headband sports a split shell stitch that creates a beautiful open lace effect. It works up quickly, and the ties allow for an adjustable fit. 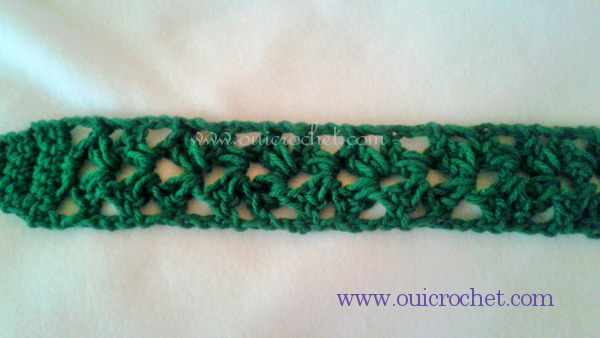 Click on over to me Pattern Gallery to check out all of the other tie headbands patterns I have shared. Row 1: sc in 3rd ch from hook. Turn. Row 7: ch 3 (counts as dc), skip next 2 sts, (2 dc, ch 3, 2 dc in next st, skip 2 sts, dc in last st. Turn. Rows 8-20: ch 3 (counts as dc), (2 dc, ch 2, 2 dc) in ch 3 space, dc in top of tch. Turn. Row 21: ch 4 (counts as dc + ch 1), 2 sc in ch 3 space,dc in 3rd ch of tch. Turn.